Writing in the current issue of In These Times, American History scholar Theo Anderson follows the modern political conservative movement’s rise to power from the founding of the Heritage Foundation in 1973 through Donald Trump’s inauguration in 2017. In 1980, that movement rode initially to White House power on the coattails of an amiable movie actor, Ronald Reagan, while picking up crucial political allies among evangelical Christians. Evangelical Christians played a major role in elevating a non-religious Reagan to the White House, even as they help toss out one of their own, a born-again Southern Baptist, President Jimmy Carter. Co-founders of the Heritage Foundation in 1973, Paul Weyrich (above) and Edwin Feulner (below), were funded lavishly by beer baron Joseph Coors. Many Evangelical Christians frown on consumption of alcohol beverages, except, it appears, when profits from those beverages fund their political ambitions. Weyrich and Feulner were shrewd political operatives who knew their targets: Americans who were rich, and Americans who believed they should be rich. Both targets believed in liberty for themselves, less so for “others”. In the late 1970s, Weyrich used anger over encroachments on “religious liberty”—namely, the liberty to deny African Americans entrance to religious private schools—to mobilize the Christian Right. His efforts propelled Reagan to victory in 1980 via another organization Weyrich cofounded, the Moral Majority. Weyrich, who belonged to a Catholic sect, spoke a language of personal responsibility that resonated with evangelicals. He believed that individualism was the heart of the Judeo-Christian tradition and its great nemesis was the growth of government. The Daily Signal looks for “what it considers outrageous government intrusions on Christians’ rights, especially their right to discriminate against LGBT people. These stories often involve the travails of fundamentalist bakers, florists and wedding planners”. With additional support from Coors, Weyrich also founded the Committee for the Survival of a Free Congress (CSFC), “an organization that trained and mobilized conservative activists, recruited conservative candidates, and raised funds for conservative causes”. Under Weyrich, the CSFC “was one of the first organizations to tap into evangelical Christian churches as places to recruit and cultivate activists and support for social conservative causes. In 1977, Weyrich co-founded Christian Voice with Robert Grant. Two years later, with Jerry Falwell, he founded the Moral Majority (1979–1989)”. Over the next two decades, Weyrich founded, co-founded, or held prominent roles in a number of other notable conservative organizations. Among them, he was founder of the American Legislative Exchange Council, [ALEC] an organization of state legislators; a co-founder of the Council for National Policy, a strategy-formulating organization for social conservatives. Heritage is not the only gun in the conservative movement’s arsenal, but its impact is obvious in the current Trump administration. As a recent Salon essay notes: Trump is that movement’s best hope yet for achieving its great dream of “gutting government”. Trump’s proposed $1.15 trillion budget for 2018, appears to race forward in that gutting effort. Domestic agencies are trimmed significantly. Only the Pentagon budget moves higher, much higher. The Trump transition team has been at work for months with career staffers at the White House and throughout the federal bureaucracy to draft a plan to cut $10.5 trillion out of the federal government over 10 years, according to multiple reports. The president-elect vowed to slash government spending on the campaign trail, promising to add those savings to the massive budget of the Department of Defense. New reporting now outlines just which parts of the federal government will be eliminated by the incoming Trump administration.. . . .
To those voters who hope that maybe the gutting of so many progressive dreams will be side-tracked with an impeachment or resignation of President Trump, Anderson delivers the bad news. Vice President Mike Pence . . .has deep ties to the Foundation. After the election of the Trump-Pence team, in early December, 2016, Pence gave the keynote speech at a Heritage event, held, of course Trump’s D.C. hotel, to honor the foundation’s biggest donors. He promised that the Trump administration “is now and will continue to draw on the institution’s work”. Weyrich died, at age 66, on December 18, 2008, a month after the election of Democratic President Barack Obama. Edwin Feulner, now 76, (right), Weyrich’s partner in establishing the Heritage Foundation, is still going strong. He began a career that included a long run as chief of staff for ultra-conservative Illinois Republican congressman Phil Crain. 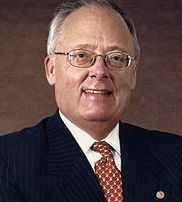 Feulner served as Heritiage President from 1977 to 2013, when he was replaced by former U.S. Senator Jim DeMint, who left a safe South Carolina seat to move to the real power center of the conservative movement. In an interview with The National Review, Feulner was asked to identify Heritage’s most important achievement. He responded, “I think we have made conservative ideas mainstream and equally credible”. With Trump’s election in November, Heritage has become a key power broker in Washington. It has an administration willing to further its agenda. The conservative movement’s rise to power began in the aftermath of what seemed like conservatism’s collapse through the 1950s and 1960s. “If Trump is impeached and removed from office, they will be happy to have Pence”. The picture of Paul Weyrich at top is from In These Times. It was taken in 1986 by Susan Biddle, for the Denver Post. It is a Getty photo. 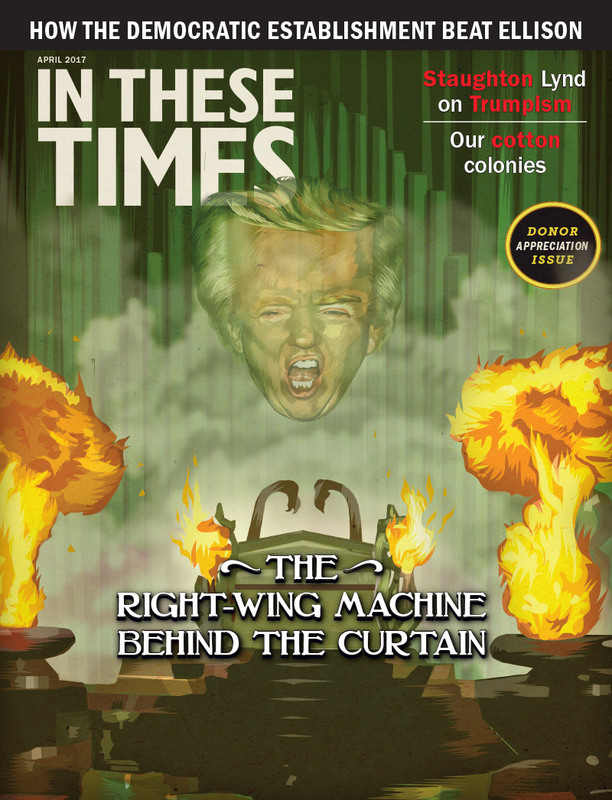 The picture of In These Times, is the cover of the April issue. 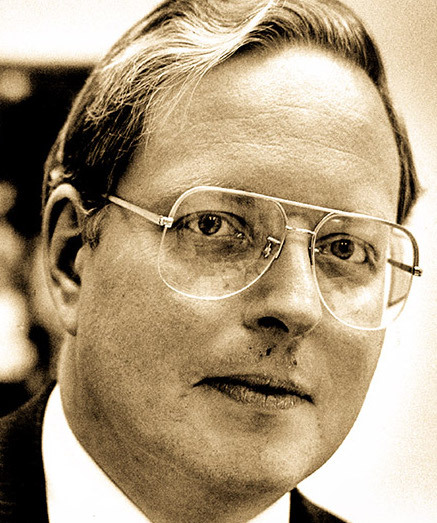 The picture of Edwin Feulner is a publicity shot. This entry was posted in Donald Trump, Politics and Elections, Stephen Brannon, US govermemt. Bookmark the permalink. Thank you for assemblying decades of informatiin to chronicle a strategic process that has brought us to where we are today in this country, much of it “out of sight” to many of us as it unfolded. We have entered another era of Social Darwinism, accompanied by the resurgence of “imperial Christianity”‘ which too often declares Caesar to be lord rather than Christ. I appreciate your writing and benefit from it. Jim, this column pulls together so much of the story that most of us are either unaware of or simply too politically naive to have paid attention to. The attention you pay, and continue to pay, qualifies you to be a “true servant of the Lord.” How indebted I am to your faithfuness! Shukran.